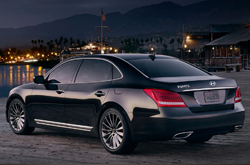 Big, powerful and luxurious, the 2015 Hyundai Equus stands toe-to-toe on power, comfort and features with major players in the luxury car market but costs thousands less. If you aren't overly brand conscious and appreciate good value, you'll want to try out a 2015 Hyundai Equus in Arlington. We recommend going the extra mile to choose the ultimate trim package which includes everything available in an Equus as standard equipment. This is the ultimately pampering luxury car. It may not match German engineering, but it seems to have a pretty good handle on opulence. 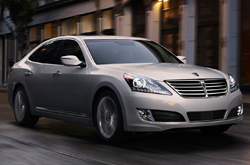 The Equus is about the ultimate comfort ride. As KBB explains in their 2015 Hyundai Equus review, "Every aspect of the Equus has been designed for driver and passenger comfort." Even with a power-adjusting tilt/telescoping steering wheel and twelve-way power-adjusting driver seat, KBB points out that Equus really stands out for its rear-seat accommodations. Even the back seats in the Equus are heated and cooled, with power lumbar support. It's so nice, you'll be in a hurry for your teen to get licensed so you can ride in back and enjoy what is purported to be the nicest rear seat entertainment system in the industry. Getting back into the driver's seat, you'll be piloting a 4,500 pound rear-wheel drive sedan, powered by a 5-liter V8 gasoline direct injection engine. The big eight is rated at 429 horsepower and delivers 376 pound-feet of torque, accelerating from zero to sixty miles per hour in 5.7 seconds. Although the Equus has a hushed cabin environment, you can still here a classically muscled engine sound that has a nostalgically comforting effect. While nobody had to pump engine noise through the stereo to achieve that softly comforting rumble, you will be able to pump whatever tunes you have stored in your iPod, smartphone or MP3 player through the 17-speaker Lexicon audio system. See more features, like the awesome headup driver display by watching the video at the end of our 2015 Hyunda Equus review, or better yet, find the real experience behind the wheel of a 2015 Hyundai Equus in Arlington by stopping by Vandergriff Hyundai for a test drive. Compare Hyundai's latest model of the Equus to its rivals and we're certain that you'll choose it over vehicles like the 2015 Acura RL, BMW 5 Series, Infiniti M Series and the Mercedes Benz E Class. TX shoppers will benefit from the Equus's modern features and bargain pricing. Compare its price to the forementioned vehicle options and you'll see that it's a spectacular value, which is one of the main reasons why so many Dallas-Ft. Worth drivers select it. For more useful facts, check out the Equus's quick-facts list below this text. 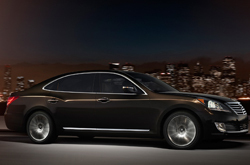 For reviews of the 2015 Hyundai Equus and prior models, Vandergriff Hyundai is your trusted resource. 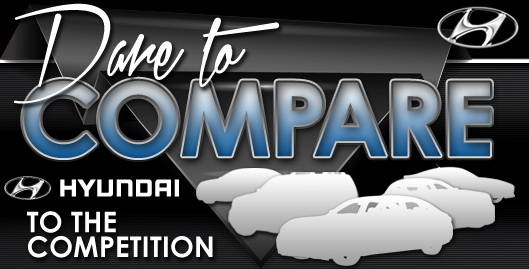 With the assistance of some of the best automotive writers in the trade, we've managed to get reviews published online for all of our models. As you read this article, you'll see that it is filled with factual information about all the things you're looking for in the new Equus - safety features and other specs included. Now that you've viewed Vandergriff Hyundai's Equus review, please pick up the phone and call us to schedule time for a test drive or learn about limited-time dealership offers and deals from the OEM.